Second publication in a week – I’ll take it! Since the article was published on our student portal, I cannot actually share a link for it – only students, faculty, and staff can see it. This little snapshot will have to suffice! Ok, ok… so this shouldn’t really count as a publication, because it’s not a piece of creative work I did or anything that required a lot of effort on my part, but I’m going to count it anyhow. 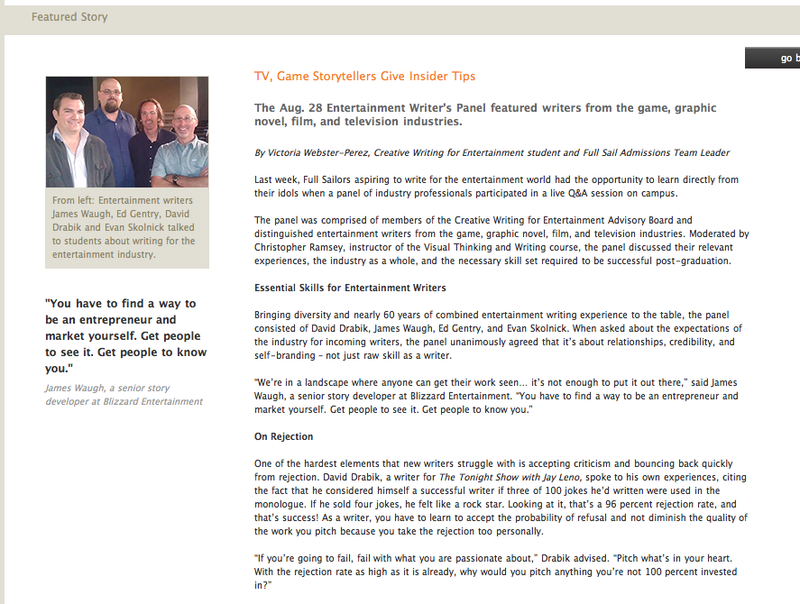 Remember that Entertainment Writers Panel I was raving about last week? Well, the summary I wrote about it was published in the school’s e-newspaper/blog. It’s the “featured story” on the student portal landing page. This is absolutely not a big deal, but, for the purposes of my 5-in-28 challenge [see Who, me? for more info], I’m counting it! So that’s 2 down, 3 to go! And I’ve got 10 months to make it happen! ← Holiday weekend = Challenge! Hey Tori! I’m glad I found your blog. I didn’t know you were a fellow writer? Secrets!! Ha ha! Wow, Melody, that is so cool! I didn’t know you were a writer, either, until I stumbled across your blog! Thank you for sharing! I will definitely enter the contest. I love flash fiction/short story pieces.